I took a walk today with an old friend. I have known her for about 12 years. We occasionally get together and take a walk. This time I brought my puppy, Lucy with us. I really needed the walk today. Didn’t have a great start to my day and was even thinking about canceling the walk because I didn’t have the ambition. But once again I am so thankful that I pushed myself. We talked about a lot of different things and shared where we are both at in our lives. She had some amazing insight into people and situations. I am always ready to believe the worst in me and have a hard time believing positive things people have to say to me. But having the time to walk (at a pretty fast pace) and hear some very deep positive insights from her helped me go home and start my day fresh. I have to say that I can actually feel it in my legs and hips. We must have walked a few miles. Even Lucy came home and has been asleep for hours. But it feels good. It is my “small moment for the day”. It is amazing what a walk will do with a very dear friend. Helps put your life in perspective. So dear friend if you are reading this, Thank you!! You did wonders for me physically as well as emotionally. Here’s to many “small moments ” in your day!! And dear friends!! This entry was posted in exercise, friends, health, old friends, walk and tagged dear friends, encouragement, exercise, feeling down, inspiration, mentally, old friends, physically, puppies, small moments, taking a walk. Bookmark the permalink. The power of positivity is tremendous!! You have the power within you to make each day a great day! Start each morning with positive self talk: I am in charge of my own happiness, not events or other people, and I’m going to make today awesome! Today will never happen again, don’t waste it! 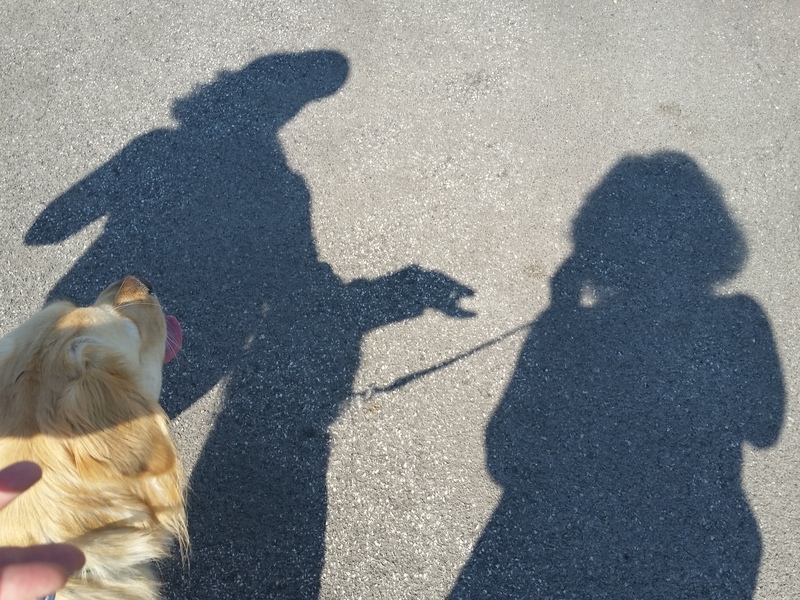 Did you notice how much your friend’s shadow looks like an angel with wings? Just sayin’!